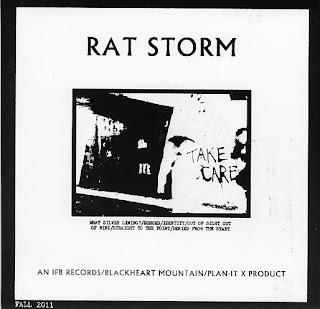 Bloominton IN's Rat Storm slash through 6 tracks of furious HC/powerviolence. They make great use of a grinding intensity as well as crushing riffs with that almost out of control sound that brings a sense of urgency and anger. Pissed female vocals front the onslaught, thoughtfully covering such topics as sexuality, prisons, and capitalism, all with additional explanatory writing. Packaging is screen printed on hand cut waste paper to minimize resource use and most insert paper was dumpstered as well. This is a split release with Blackheart Mountain and Plan-it-X Records. They are sold out. Download here - Rat Storm - Fractured 7"